Two police officers in western Pennsylvania were shot, one fatally, in an ambush-style attack early this morning, state police said. 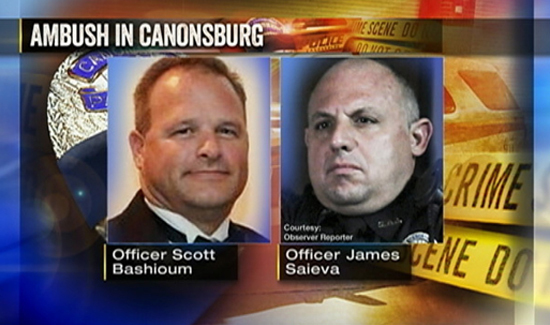 The shooting happened in the town of Canonsburg, about 18 miles southwest of Pittsburgh, after the officers responded to a call about a domestic incident at 3:14 a.m. The officers were ambushed upon arrival “as soon as they approached the front of the residence,” a Pennsylvania State Police spokesperson said at a news conference this morning. Authorities said there was an “active PFA,” or protection from abuse order, at the residence where the officers were dispatched. Shortly before noon, Canonsburg city officials said that there is no longer an active situation or threat to the community. Regarding the suspected shooter, they said a man and woman were found dead inside the home where the ambush took place. Both died from gunshot wounds. Officials said the man’s wounds appear to be self-inflicted. The man was known to officers, authorities added. Earlier this morning, some residents in the neighborhood were asked to vacate their homes, while others were ordered to stay inside. The Canon-McMillan School District was closed for the day and another local school had a delayed opening due to the shooting, according to state police. The slain officer was identified as 52-year-old Scott Leslie Bashioum, according to the Washington County Coroner’s Office.